No, you haven’t stumbled into the naughty toys section of this site by mistake, this really is the Fashion and Beauty area. It seems that the beauty world has discovered its latest gimmick to lure us all into buying their products. Vibrating beauty. First up, Estee Lauder. They’ve introduced the TurboLash All Effects Motion Mascara (right) This award winning £28 mascara claims to improve volume, curl, length and separation with one coat as it buzzes through your lashes. Which all sounds great, though I’d be a little nervous putting something vibrating so close to my eyes. Maybelline also offer a vibrating mascara, costing half the price, falling under the name of Pulse Perfection. I have to admit I’d be more tempted with the cheaper option. Plus you can choose to turn off the vibrations with the latter. 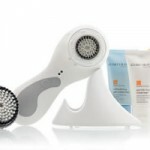 Neutrogena have been in the buzzing beauty market for a while now with the impressive sounding ‘Wave Power Cleanser‘. Sounds like a floor cleaner, looks like a foot exfoliator, and apparently the vibrations open up your pores to thoroughly clean your face. All you have to do is pop one of the disposable pads into the attachment, rinse it to activate the foam, and then power it up and cleanse away. Probably not the most eco-friendly product due to the disposable pads, but it’s cheaper than I had assumed at £12.99. So that’s makeup and skincare covered, but what about your hair? 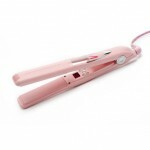 The Pink Vibe Hair Straightener is the kind of product a curly haired girl like me loves. I’m addicted to my GHDs, but these straighteners claim to eliminate any pulling or snagging with its vibrating action. The vibrating function means that you don’t have to clamp down on the hair so hard, and therefore avoid causing too much damage to your hair. They’re £94 if you fancy something a bit different. 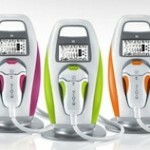 Is the very expensive E>One laser hair removal gadget any good? I have the Estee Lauder mascara, and whilst it’s a great mascara, I’m not sure the vibrating element actually does anything. Having said that, when it implied it was going to stop vibrating a couple of days ago, I did have a little cry. It’s got to be another one of those strange beauty gimmicks – like the white mascara that goes over your black mascara. Wait, doesn’t the black mascara go ogver the white mascara? Or was I doing it wrong that entire time? Dear god, what a fule. I meant under. White *over* would look preposterous. I have not much time, but I've got many useful things here, love it!